There is a potential to be a little extra irrespective of the stage or phase in life that one is in. 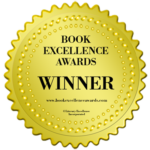 This book intends to kindle the positive attitude and create the right mindset required to produce extraordinary results. It inspires the reader to contemplate on the message of ‘a little extra’, be ‘a little extra’ and acknowledge those who are ‘a little extra’. 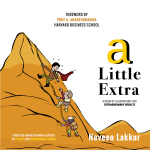 Naveen's latest book 'a Little Extra' captures the essence of innovation - a simple idea with high impact. This is not surprising given Naveen's vast experience as an innovation coach. On the surface, this book might feel like a quick read, but I found myself pausing at each set of illustrations to ponder on the real underlying message. Thanks Naveen for this delightfully simple yet deeply insightful book. Rahul Abhyankar, Cofounder, Institute of Product Leadership, Los Angeles - USA Naveen's latest book 'a Little Extra' captures the essence of innovation - a simple idea with high impact. This is not surprising given Naveen's vast experience as an innovation coach. On the surface, this book might feel like a quick read, but I found myself pausing at each set of illustrations to ponder on the real underlying message. 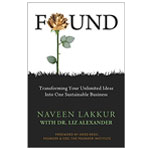 Thanks Naveen for this delightfully simple yet deeply insightful book. No idea is a bad idea if only you know how to deal with it. This book, through a five-step framework, will help in the process of ideation. It shares a simple methodology for validating ideas and learn from people who have been there and done that. This is a go-to-book for aspiring entrepreneurs and intrapreneurs for ideation. If you are someone who keeps popping out new business ideas and need a sounding board to validate your thoughts, then this book is a must for you. It will certainly help you come to a decision on choosing a sustainable business idea, through a disciplined approach. A realistic insight into the highs and lows of starting up, and highly recommended for all budding entrepreneurs and intrapreneurs before taking the big jump. By Mary Ann George on 21 January 2016 If you are someone who keeps popping out new business ideas and need a sounding board to validate your thoughts, then this book is a must for you. It will certainly help you come to a decision on choosing a sustainable business idea, through a disciplined approach. A realistic insight into the highs and lows of starting up, and highly recommended for all budding entrepreneurs and intrapreneurs before taking the big jump. A book which has to be read by anyone who has an idea looking for conversion to a business model and who want to be entrepreneurs. Creation of idea is good. Sustainability and scalability are very essential in any business idea. Execution is also a key factor. 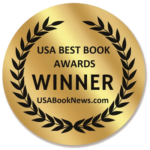 The book focuses on how to select and pursue a winning idea. FOUND offers a guiding process to identify the viability of a business idea. The book FOUND has to be kept in all the incubation centers and colleges conducting entrepreneurial initiative programs and courses. By PK Sambamoorthy on 24 January 2016 A book which has to be read by anyone who has an idea looking for conversion to a business model and who want to be entrepreneurs. Creation of idea is good. Sustainability and scalability are very essential in any business idea. Execution is also a key factor. 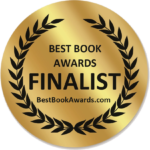 The book focuses on how to select and pursue a winning idea. FOUND offers a guiding process to identify the viability of a business idea. The book FOUND has to be kept in all the incubation centers and colleges conducting entrepreneurial initiative programs and courses. Inspiring the budding entrepreneurs and managers, this book proves to be a guiding light. It talks about twelve distinctively paired principles that come together to unleash new power. This book brings a dozen paired principles which can be implemented in workplace and also in daily life. The results are bound to happen once these paired principles are applied. It has proved very powerful in igniting young minds to seek success, ethically. Naveen Lakkur has beautifully explored the intrinsic parts of starting up as Inseparable Twins which every entrepreneur will experience during their startup phase. With interesting anecdotes, he shares his learning with the readers by discussing topics about ideation, innovation, execution, funding and lot more. This book got me hooked the moment I started reading it and it was like learning 'Life Lessons' for startup entrepreneurs. Appy and Proppy's journey from an idea to starting up makes it very inspiring. It got me excited to kickstart the project that I had been delaying for over an year and I'm positive that it will for you too! 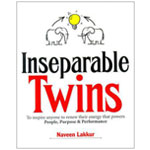 By Amazon Customer on 17 March 2016 Naveen Lakkur has beautifully explored the intrinsic parts of starting up as Inseparable Twins which every entrepreneur will experience during their startup phase. With interesting anecdotes, he shares his learning with the readers by discussing topics about ideation, innovation, execution, funding and lot more. This book got me hooked the moment I started reading it and it was like learning 'Life Lessons' for startup entrepreneurs. Appy and Proppy's journey from an idea to starting up makes it very inspiring. It got me excited to kickstart the project that I had been delaying for over an year and I'm positive that it will for you too! If you want to have the cake and eat it too, this is a book you must read. Naveen elaborates the beauty of balance in a narrative that's gripping, fun as well as informative. 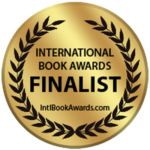 Unlike any other book on business and innovation, this book spans like a story from the point of view of 2 twin elephants appy (who represents happiness) and proppy (who represents prosperity). The story covers 12 pairs of qualities that have to coexist for a sustainable business. All in all, Inseparable Twins is a very exciting book and a must read for every Entrepreneur. By Srikanth Acharya on 13 March 2016 If you want to have the cake and eat it too, this is a book you must read. Naveen elaborates the beauty of balance in a narrative that's gripping, fun as well as informative. Unlike any other book on business and innovation, this book spans like a story from the point of view of 2 twin elephants appy (who represents happiness) and proppy (who represents prosperity). The story covers 12 pairs of qualities that have to coexist for a sustainable business. All in all, Inseparable Twins is a very exciting book and a must read for every Entrepreneur.